My old 1230 came home from that service in early September. It behaved well for the first garment worth after it came home. After that it resumed having small hiccups occasionally. These got more frequent and severe, until 10days ago the misbehaviour was so bad I gave up on her and went to working with the (older but new to me) 830. I’d had to turn her off and back on again maybe a dozen times to just get through the front bands on that black shirt. So I resumed looking for machines. This time focusing on ones of a similar vintage to my 1230. My wanted features list has been refined. It sure helps to know what you are looking for. I very nearly committed to buying a 930, which as best I can tell, is the first machine from Bernina with a stepping motor. Before that, I had another quick look to see if anything better had turned up. Lo and behold, there was an 1120 on offer!! I decided to grab it, having not seen anything of the 1100 or 1200 ranges in the months I’ve been looking. It’s very similar to my 1230, a bit simpler and a bit older. Today, the 1120 arrived by courier. All the essential stuff is there. I’ve been trying to work out how much use she has had. It’s hard to figure. 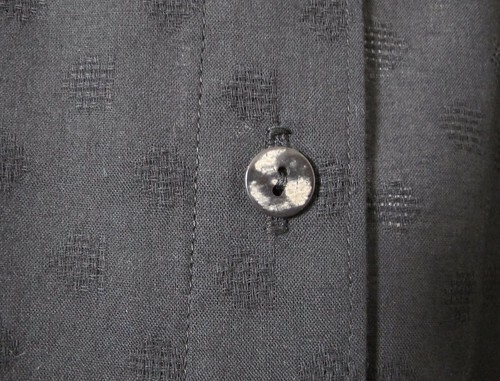 I was initially saddened by what I thought was yellowing of the stitch selection buttons…. but the machine has a bit of a brown theme. The dials and buttons are all pale brown. The power cord is a darker brown. I laughed, relaxed a bit and looked further. Below are a bunch of pictures. In all cases, my old 1230 is on the left, the 1120 on the right. The yellowing story is interesting. The overall body enamel on my 1230 is a little darker than the 1120. Mine has lived out on a sewing table for most of her life, sometimes covered with a cloth, rarely in full sun. The 1120’s carrying handle is more yellow, as is the inside of the accessory box. The 1120 has more chips out of the enamel and a bit of damage to the upper dial. Other observations are that the knee lift, flat bed table and stitch plate are all very stiff to install/remove. I presume then that these were not used very much. On the other hand, the foot pedal is pretty dirty. I reckon the machine spent a lot of time set up, but with the carry case used as a cover. The accessory box must have been left out and open a lot (mine has mostly been in a drawer so has little yellowing. None of this tells me how much use she has had. The flywheel doesn’t help, one barely needs to touch it given the stepping motor. The bobbin shuttle running surface looks worn to me. I’d say that speaks of a fair amount of use, possibly with less frequent cleaning and oiling than it ought have had. However. The important thing is that the 1120 sews well. On a quick test she does. The motor hums a bit but the stitch formation is excellent and she is nice and responsive, including reverse which has been playing up on my 1230 for ages. Oh, and the 1120 cost me a bit less than the quotes for fixing the 1230 (yeh, various diagnoses and no witness of the bad behaviour by the fixit people…. I’m therefore not trusting that a fix would be straightforward). Now to decide on something to sew to give her a bit of a run. Knitted for myself from Schoppel Wolle Crazy Zauberball yarn in a colourway that I love. Toe up (Easy cast on, Wendy Johnson slip stitch heel pattern but done with eye of partridge heel). 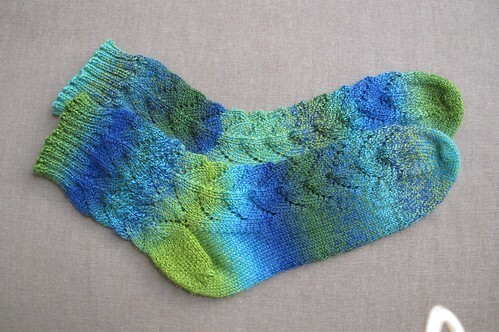 The lace pattern is from “Dragonfly Socks” via Ravelry. 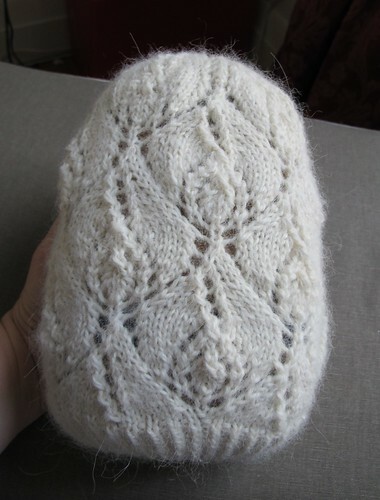 I’ve knitted it in the opposite direction though so it comes out upside down and more like arches. Wardrobe basics. 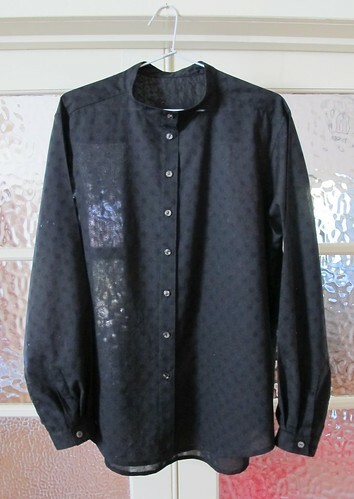 A plain black shirt. I’ve wanted one of these for a few years. Now I have one. I’m not quite sure where the fabric came from, the Fabric Store I think? It’s light weight cotton, almost voile, with “double weave” (or whatever the correct term is, tell me if you know) spots. I sewed the front bands on my regular machine, the misbehaving Bernina 1230, and boy was she misbehaving that day!! I had to turn her off and back on again about 10 times just to get the front bands sewn. So, the rest was done with the recently aquired 830. I think with a bit more practice, she will do nicely. At least until I figure out what comes next. The two new rows of blocks are assembled. Now to do the two ziggy zaggy seams to join them to the main section. Wow, that went quickly. I’ve done all the extra blocks and joiners. 28 blocks and 30 blacks. 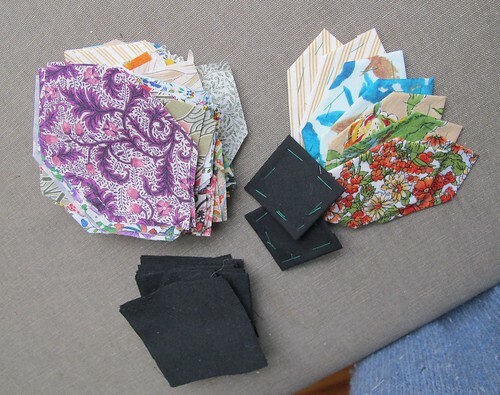 Below I’m laying out the new blocks to get a good spread of fabrics. I shifted a couple after looking at this photo, including softening the proximity of those two bright yellow pieces at top right. I’m sure I’ve said it before, but taking a photo, or even just looking through a camera gives one a different view and can show up things that might be better changed. Now the blocks are stacked in order and labelled so I have a better chance of not confusing things. Then I realised I’d better label the main section too. It’s square and I mean to hang it again shortly to release the cutting table for other work. I ought be able to tell by the orientation of the colour categories in the blocks, but this makes it easy to tell which sides I’m supposed to be adding to. I was wanting another evening dress. 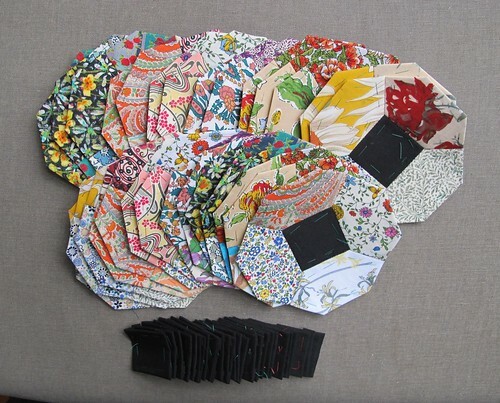 I hadn’t been able to settle on a plan for any of the new lengths of fabric from stash. I was however suddenly struck with an idea for remodeling a frock that has been languishing in the wardrobe for a few years. In one day I had the inspiration, cut it up and remade the outer dress. 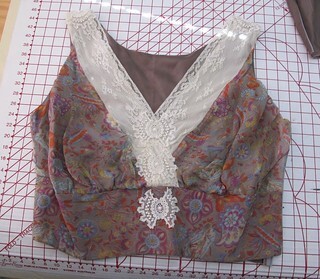 This is the bodice, firstly after I hacked the skirt off. Silly me forgot to take a proper before photo. 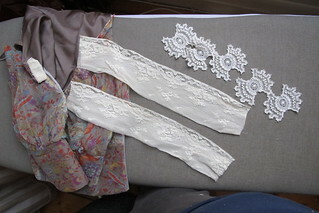 Then with the vintage lace separated out for reclamation. That waist section was a little too tight when I first made it and is now even more so. Drat the effects of advancing years. 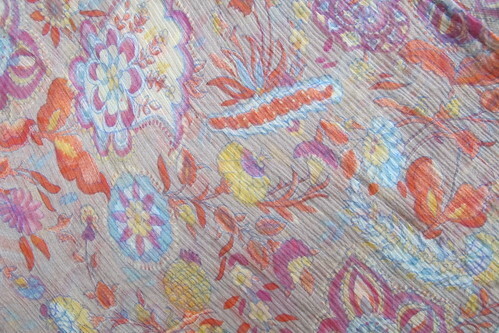 The fabric is so lovely, it’s worth reworking it so I can wear it. I found enough left over fabric to cut a new bodice. Short waisted, cross over. Based on the T bodice pattern I’ve used for several dresses. Not sure if I’ve posted any of them here? I’ll look later and maybe update. Anyway. I sewed that up the same morning. Then I regathered and attached the skirt, with a facing behind to form a drawstring channel. It’s crinkle silk chiffon again. Working with this stuff is sort of like sewing air. The sewing itself tends to go fairly smoothly I find. It’s the handling and fabric placement that takes extra time. I do recommend using silk sewing thread. It blends with the fabric, doesn’t fight it. Obviously I can’t wear it like that alone. 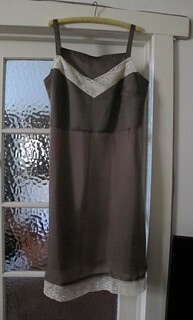 The original frock was fully lined. So I reclaimed the lace trimmed skirt from that and made a new slip on bodice from a coordinating rayon lining fabric with the reclaimed lace strips for the neckline. Silly me sewed the back of the slip bodice on inside out. I decided it wasn’t important enough to be worth unpicking. So if I haven’t got my hair down, the label will be visible through the floaty frock. Oh well. And here they are together. 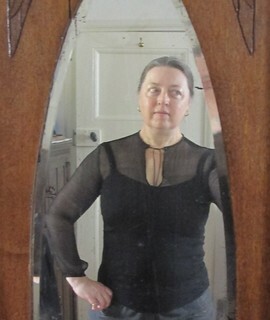 Floaty, comfortable, sleeved and less formal than the original, if a bit less flattering perhaps. One wearable dress from an unusable one. 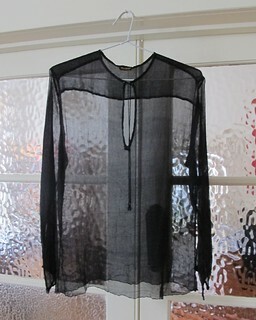 Sheer stretch without knit in natural fibre even. Slim fit in luxe fabric but comfy. The magic of silk crinkle chiffon. I’ve done this before by accident. 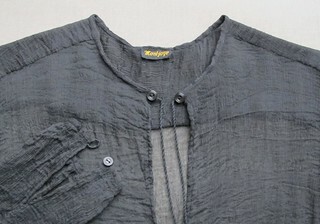 Make a garment in crinkle fabric, wet it, the fabric texture condenses and becomes closer fitting and springy. One of these garments became a favourite. Another I didn’t like because it clung to bits of my anatomy that I didn’t want to show off. I’ve been meaning to have another go for ages and here it is. 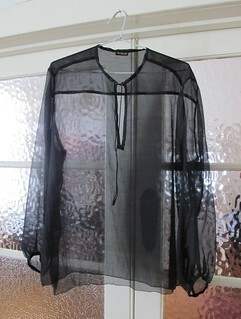 I cut a collarless shirt in black crinkle silk chiffon straight off the bolt. It’s much easier to work with pre wash. Otherwise all the little pleats get in the way and I think it’s harder to estimate the fit, though one could possibly use patterns meant for stretch fabric. Anyway. This is yet again my standard shirt pattern, cut with the centre front on a fold. 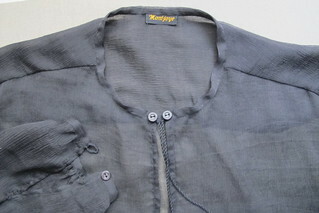 I’ve left the shirt tails off, shortened the sleeves slightly, gathered the sleeve ends, faced a slit for the neck opening and bound the neck and wrists with straight grain strips of the same fabric. 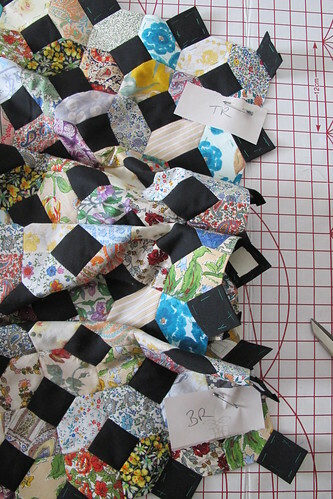 No interfacing, I wanted the fabric to be able to transform freely. The narrow bindings don’t need support and the straight grain prevents unwanted stretch. All sewn with silk thread so that it moves with the fabric and stays fluid. I wore it once before I washed it. Loved it! 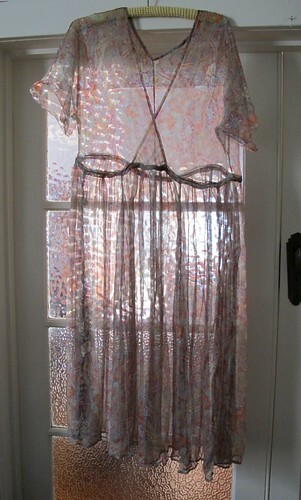 So I might also eventually make a similar top in plain chiffon. Here are three before and after shots of the magic transformation wrought by wetting. 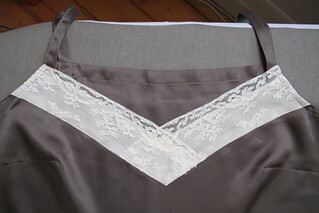 The “before” shot below was prior to making the fastenings. The tie is a twist cord made from… silk thread of course :-). I wore it once before I washed it. Loved it! 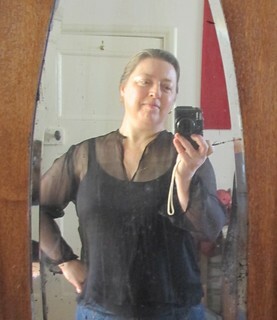 So I might also eventually make a similar top in plain chiffon. I’m also mostly happy with how it pulled up. The body fit is lovely. I hadn’t realised that one loses a little length too, so if I make another, I should add a little length to both body and sleeves. 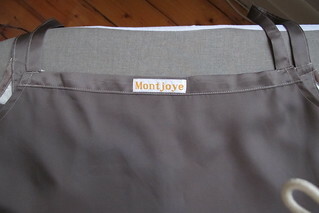 The post wash micro pleat version hasn’t been for an outing yet but I’m looking forward to that. 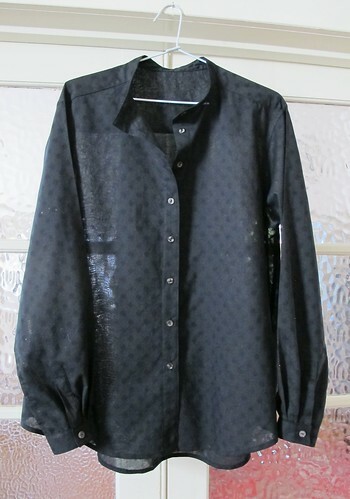 Oh, and extra bonus: with careful hanging after a wash (admittedly by hand), there is no need of ironing. Yeh, this is still fun. 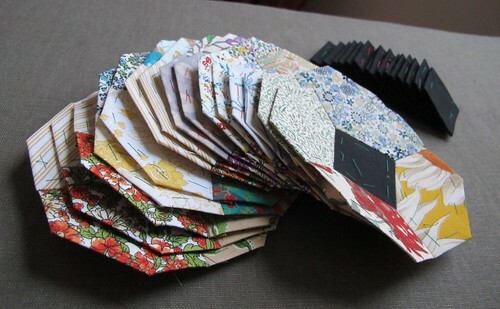 This is just over half the pieces needed to finish the lattice patchwork by the latest plan. I wondered if I would have any trouble resuming production. Nup. The whole process is embedded in physical memory. I’m amused by that. Thankfully after a 3 month break, it’s all again. 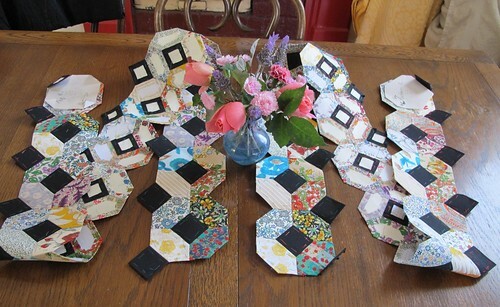 Remember the Liberty lattice patchwork that I thought was finished back in July? 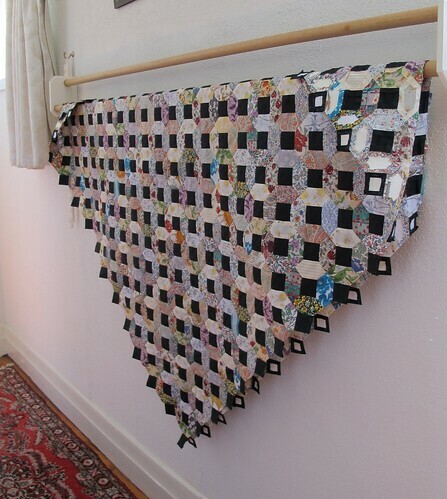 I was concerned when I realised that the way I’d had it hanging for months was starting to distort the fabric because the whole thing had gravity pulling at it on the bias. I decided to move on and work towards finishing it. While handling the black fabric to cut the border, I got suspicious. Belatedly suspicious. I did a burn test on the black and found the ruddy stuff is polycotton!! Horrified I was. Still am, though I’ve calmed down a bit a week or so later. Several friends pointed out that polycotton is likely to stay black longer than pure cotton. Which is true, but I’m still sad. 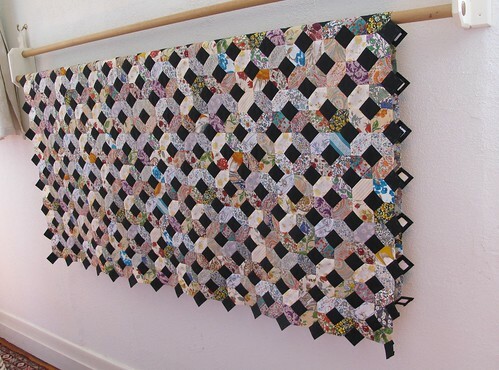 I’ve solved the bias drag by hanging the quilt on the diagonal, which puts the fabric on the straight. I could just fold it up I suppose, but I’d have to press it before layering. On the other hand, it’s lighter now that we are past spring equinox and perhaps I should put it away to prevent fading before it’s even finished. I can’t do anything about all those black squares except live with them. I am however unwilling to feature the black any more than this, so I’ve stepped away from the plan for the bold black border. 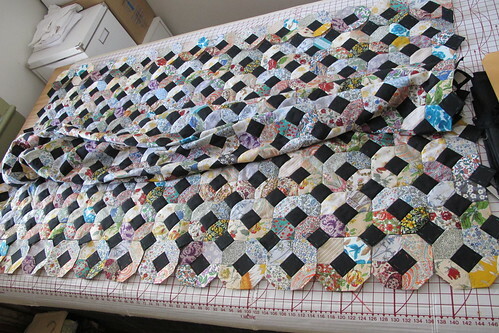 I checked the measurements of the patchwork as it stands against the bed. 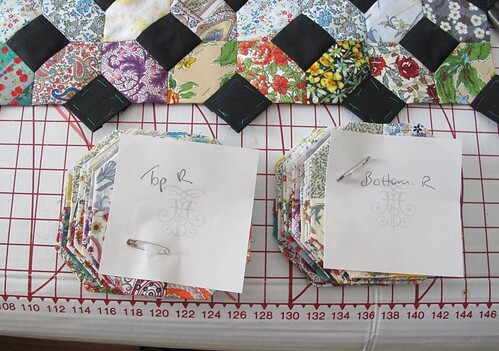 If I make another two rows of blocks and add them to opposite sides of the current square it will make a usefully sized rectangular quilt. This needs 28 blocks plus the same number of joining squares. I think I’m up for that. 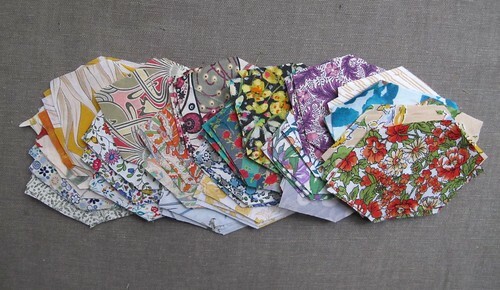 Checking my remaining fabric stocks said there was enough to cut the pieces from 6 different fabrics of the 4 approx colour categories. Hopefully that’s enough variation to prevent the new rows looking like add ons. It’s been long enough since the previous efforts that I actually quite enjoyed this little bit of basting. Long time no post. I’ve been working on presents that I can’t publish yet, things I don’t normally post here like gardening and brewing. 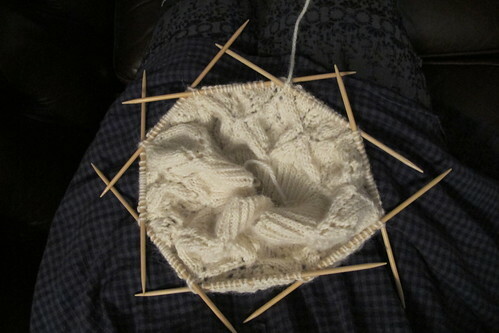 Also, fiddly knitting. This is the most difficult lace pattern I’ve knitted yet. It gave me a bunch of trouble until I found a needle arrangement that worked for me. I started on a circular with magic loop, which was fine for the rib band but I quickly got muddled after I started the lace. I moved to the only dpns I had of the right size, which happened to be slippery metal ones. I was better able to keep track of where I was at with the dpns but the weight of the work+needles dragged a bunch of stitches off the next needle in line. Horror. 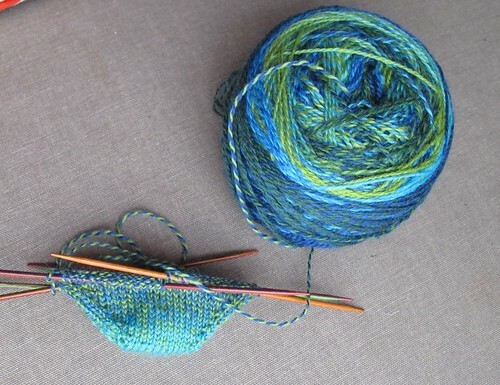 Picking up dropped stitches in lace knitting isn’t easy! A clever friend suggested using one needle per pattern repeat, and lighter, more grabby bamboo ones. She even loaned me the needles. This worked much better, and looked pretty amusing. Steam blocking over a tailor’s ham shows off the pattern. 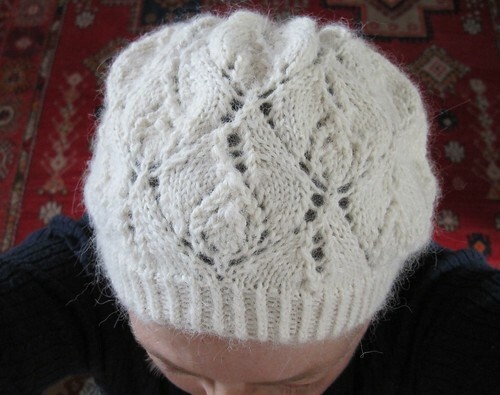 It’s by Tin Can Knits and the rose motif is inspired by the art of Charles Rennie Mackintosh. And on. The fit is good. I made the rib band bigger than the largest size by 8 stitches but the rest is to pattern. 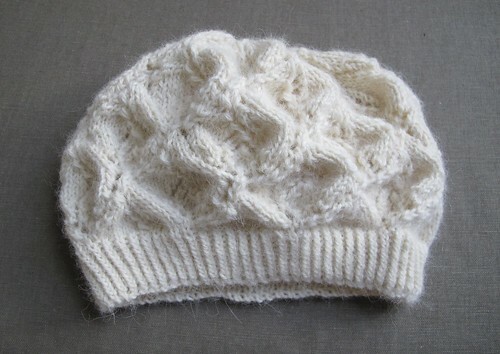 I’m not happy with the gathering at the top of the crown, but it’s a nice warm hat and pretty. Very warm actually. This is 8ply yarn and is thought to be alpaca, or alpaca rich (It’s from Bendigo Woolen Mills back room, unlabelled clearance stock). I’ll need proper cool weather to wear this comfortably. I’m amused that this photo inadvertently shows evidence that I do actually possess eyelashes, they are just too fair to be seen usually.